I would like to tell you a wonderful story about my friend and someone I do not know…Taylor Swift. My friend, Linda, has had the most terrible history with cancer. She’s a single mother who has tried everything within her arsenal to stay positive, healthy and motivated. So when she found out it was back, with the holidays approaching, she started to reach out to her friends. I helplessly watched her post messages of her condition for months. I read through them trying to find any opportunities of things I could help her with, or just to try to make her feel better. When I saw this post, and read that she wanted a card from Taylor Swift, I thought to myself, there’s no way I can make that happen. Still, you can only ever try, and that is good enough for me. I had a brain tumor removed in May of 2010. An adrenal tumor removed in aug 2010. Diagnosed with neurofibromatosis in 2014. Thyroid biopsy and hysterectomy in 2015. Double mastectomy and DIEP Flap reconstruction afterDec Bilateral Mastectomy with DIEP Flap reconstruction. Then six weeks of radiation. In August I had the biopsy. The I went bi-weekly for chemotherapy. My last treatment was Nov 29th. The Bilateral Mastectomy and DIEP Flap reconstruction is where they use my stomach tissue to create new breasts. I hadn’t known her history before, but to think of one person having to go through all of this tore my heart into two. Life really isn’t fair at times. Okay Linda, I’m going to try my best! She told me her daughter Jolynne, 8, was the biggest Taylor Swift fan and sent me a few adorable photos. Of course, the first thing I thought of was to ask my wonderful boss, Arianna, if she knew Taylor Swift. She replied that she unfortunately did not know the her, but would love to. I was immediately disheartened thinking, well of my limited connections, that was the only path that had a glimmer of hope. Still, I had to move onto plan B. I posted a heartfelt ask to my friends on Facebook. Maybe someone knew someone who knew the Megastar. With a stroke of luck, my friend Dwayne Seaton came through. He is a long-time friend, but also Founder of “Sounds of Tomorrow”, a wonderful company that takes at-risk talented youth and gives them an opportunity of a lifetime by helping connecting them to industry professionals. One of those is Dwayne’s partner, Jerry Wonda (who has produced the Fugees, Michael Jackson, Mary J Blige and a long list of amazing musicians after), who happened to know Taylor Swift’s managers! Dwayne gave me the contact information and wished me luck. I received his message late at night, after a long day of work, putting the kids to sleep, taking care of the dog and going through more of my friend’s sad posts. I was mentally exhausted but Dwayne’s message gave me hope, so even though it was after midnight, I began to draft this letter. I honestly didn’t think anything would come of it. To me, just the effort of making this would probably make my friend feel less alone, that there were people out there who were doing their best to try to salvage the holiday for her. I put it into the mailbox the next day. Many days passed and I didn’t hear anything. Some friends asked me a week later about it and I shrugged my shoulders. Who knows how many letters her manager gets. What’s the chances they would see it. A few days ago, I saw some sad news. The next day, she had surgery. She kept a pretty positive attitude. Her boyfriend, this amazing man that has been there helping her through this entire ordeal, started to post updates. He said the surgery went well, the cancer hadn’t spread and there was a chance that she would be able to be released for Christmas. What amazing news! We were all ecstatic. I was so happy for them. Thank You Taylor Swift for making her wishes come true…..
Look at that girl, check out mom’s smile! All in all Taylor Swift sent a huge package of Christmas ornaments, scarves, pictures, an album and more. Some of it was even autographed. 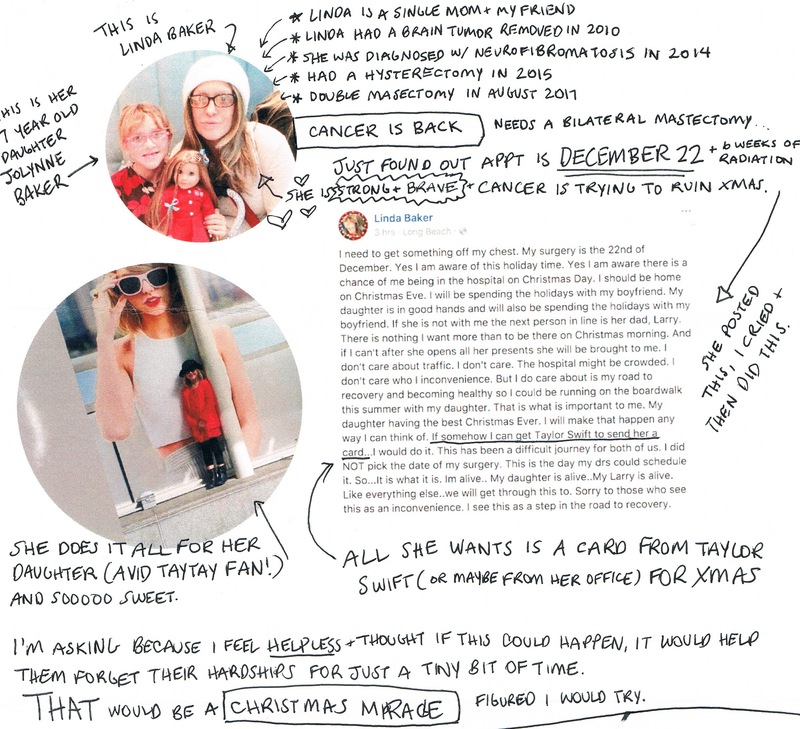 I don’t know what to say except that Taylor Swift saved Xmas for this family. My friend went to bed hearing that her surgery was a success, that the cancer hadn’t spread, that she may leave early and just having the peace of mind that her daughter was preoccupied with these tremendously generous and amazing gifts from her biggest obsession. Her daughter probably didn’t sleep at all ha. I can’t believe how wonderful Taylor Swift and her team is. We are ever so grateful. It was the most generous thing they could have done and it means so much. Truly a miracle. Wherever you are Taylor, I’m going to have to agree, you definitely do have a Big Reputation, with all of us here in New York. Thank you for making this one giant magical amazing Christmas. You are truly an angel.